The province of Massa Carrara is comprised of the homonymous ancient duchy and the sub-region Lunigiana. Bordered by the La Spezia, Parma, Reggio Emilia and Lucca provinces, Massa Carrara also possesses a coastal area banking the Tyrrhenian Sea. Due to its climate and industrialization, this area is the most populated zone in the territory. Apart from its Capital, Massa, the most important loci of the province are Carrara - known widely for its plethora of marble caves, Pontremoli, Fivizzano, and Aulla. Tourism is mostly centered around the beach resort culture of the Marina di Massa and the Marina di Carrara. However, Massa Carrara also boasts an artistic heritage of museums, castles, archeological sites, rustic chapels, and majestic natural surroundings. Over the centuries, the roads of Massa Carrara have been well traveled by a variety of distinct groups and peoples. Armies, merchants, and pilgrims at different times pervaded the area, while workmen and artists from Lucca, Genoa, Florence and even France crossed over into the Tuscan province to enrich towns and villages with their presence and their craftsmanship. The province's principal importance today stems from its chief location with regard to commercial trade and exchange. This positioning enables central and northern Italy to advantageously use its port as a supply source for raw materials and as an outlet for exports. The mountainous quarries of Massa Carrara have been a principal source of marble ever since the days of the ancient Romans, and have been visited accordingly "by everyone from Michelangelo to Henry Moore." Carrara continues to be the largest producer and exporter of marble in the world, and is responsible for shipping 1.5 million tons of marble annually from its port in the Marina di Carrara. Additional caves are sprinkled throughout the other communes of Massa, Fivizzano and Montignoso, where various types of marble are extracted: "Statuario" (an extremely white-colored marble), "Bardiglio" (a blue marble), "Paonazzo" (a multicolored marble), "il Fior di Pesco" (a marble whose name literally means "peachtree flower"), and "il Cipollino" (literally meaning, "little onion"). At the end of the road take a left onto Viale Cristoforo Colombo. 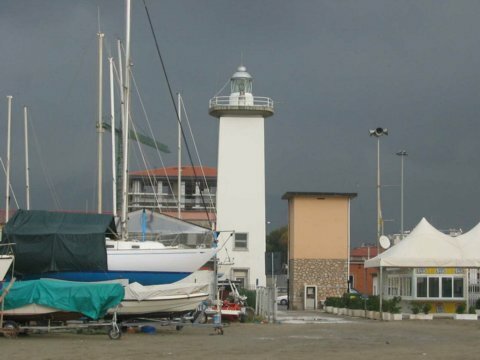 This will take you to Marina di Carrara where you should see the lighthouse along the shore.